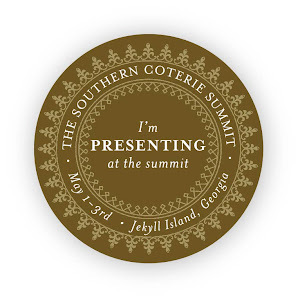 For the first time in the history of Southern Belle Simple, I’ve been given a blog award! 3. Pass the award along to 7 bloggers who you have recently discovered and who you think are fantastic! 1. I'm a bona fide pack-rat and have to force myself to purge my closets regularly lest become a hoarder. 2. As a child, I memorized an entire book of Shel Silverstein poetry and can still recite most of the poems to this day. 3. I was googling family names the other day and ended up finding my 19th great-grandfather Philip de Hampton who lived in England in the 13th century. 4. Smell is my dominant sense...I smell everything (often an annoyance to the folks who know me). 5. I would love to have an art studio where all my art stuff can live in one easily accessible spot (it is currently stored away in lots of nooks and crannies). 6. I rode to my high school prom in a green Plymouth Acclaim with at least one hubcap missing and I wouldn't have wanted it any other way. 7. I am so obsessed with health and beauty products that when I was in London, I skipped out of touring the British Museum to go to a drugstore and buy make-up! Thanks again Tracey for choosing me! My first blogger award…now I gotta make some room on my mantle!